or not... I'm trying to sort out my fabric collection (never sure whether there's enough of it to qualify as a stash). Sometimes it has to get worse before it gets better. It's a good thing I have a friend to keep me company. The great thing about sorting all this stuff out is that it gives me the opportunity to revisit and gloat over my precious hoard from the Stitch Gathering. 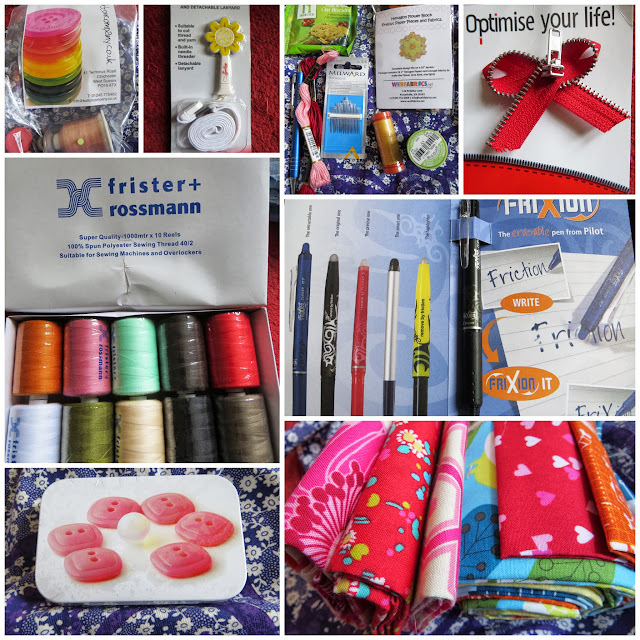 Thanks to all very generous sponsors: Avery Homestore , Frixion pen by Pilot, Frister & Rossman thread box from sewingmachines.co.uk, assorted buttons and thread from buttoncompany.co.uk ,Coats Crafts UK for a collection of goodies including Millward needles, Hexagon Flower Block by webfabrics.net, Liberty Art fabrics, Nairn Oatcakes, Beechwood Quilting, Groves, Robert Kaufman fabrics, Aurifil - and to Ali of Very Berry Fabrics for this lovely scrap pack. 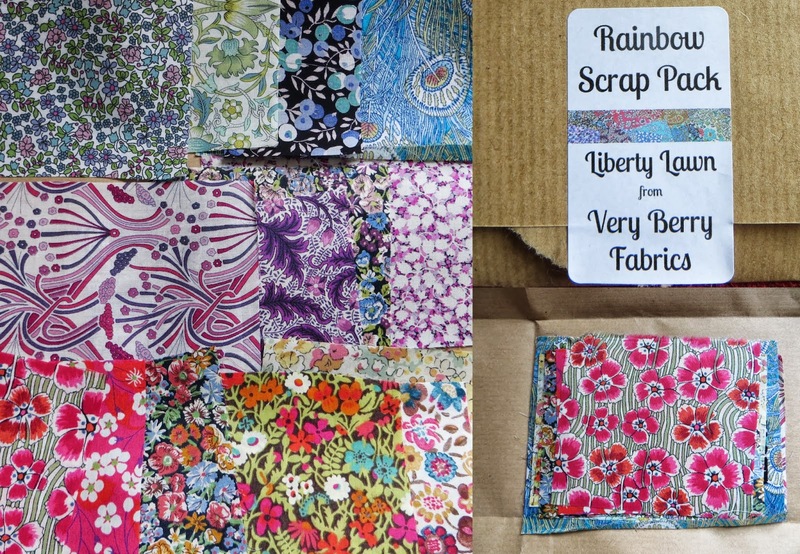 I am a bit of a Liberty hoarder having already been tempted several times by fabric in Ali's store, so I had brought along some of it for Sheila Donnachie's crazy patchwork class at the Gathering. I love the way that Liberty combines with other fabrics, and this class was good timing as I have been thinking about the relationship between Japanese boro fabrics and English crazy patchwork and have a plan for a little project which combines a bit of British/Japanese inspiration. Ali had very kindly sent me some fabric earlier in the summer so that I can try out this idea - and since I plucked up courage to throw financial caution to the wind and bought my lovely new sewing machine there's no excuse not to post more about this very soon! Good luck with the sorting. I am usually too easily distracted by fogotten purchases to get very far! Ooh! i shall look forward to seeing the crazy patchwork as that is the only kind I seem to be able to do and I love it. I love the fact that you can use every last little scrap of fabric - though if you use all yours you will be kept busy by the look of things! Hope you finally got all that stuff put away with your lovely helper to supervise! I think that probably counts as a stash! The consensus seems to be, that yours definitely counts as a stash! The boro/patchwork project sounds intriguing, can't wait to see it. Good for you Catherine, I am sure 'you're worth it' - talking about your new machine here! Thanks for all the sponsor attention and please link this up to the linky party thing I'm doing (sorry to be a bore!). Love your Liberty stash! Your cat is giving good moral support there! Liberty, boro, crazy patchwork... Sounds like a very interesting mix. I look forward to seeing what you do! Now that's a proper stash, I need to work harder.... And I need four legged supervision!! Love the look of your crazy patchwork. How's your new machine?